I also like to plan stuff. In fact, if I am totally honest (and I always am in this space), I have five ways of keeping track of stuff: my lesson plan book, my online lesson plan book, my personal planner, our wall calendar, and our shared family calendar on Cozi. Lately, Cort and I have been talking about having a 10-year plan. Now that we are well into our child-bearing, we wanted to start making those vague “some day” plans into something more tangible. For instance, ever since moving into our house, we talked about what we would want in our “forever home” and how many kids we would have, and what sorts of vacations we would love to take both just the two of us and as a family. We’ve discussed new vehicles and possible “fun” items. But up until recently, with the school loans and the just overwhelming BUSY of our lives, we chunked it all under the category of “Some Day”. And just like the universe usually works, suddenly an opportunity fell in my lap. 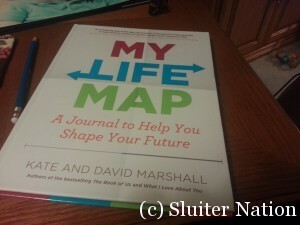 I had the chance to review My Life Map by Kate and David Marshall with the BlogHer Book Club. It’s actually more of a workbook/journal than it is an actual book you would sit and read, so I was surprised to see it as this month’s choice, but I am not complaining. It starts by talking about how the book works and why it would be beneficial to make maps for your life. It then gives you some samples of Whole Life maps. The book’s chapters guide you through some leading questions to help you figure out how to fill in each section on the Whole Life maps. To be honest, the Whole Life map sort of overwhelmed me. I mean, I can fill in the past and the present, but I sort of hyperventilated when I got to the “future” questions. And so I moved on to the Ten Year Subject Maps. Ah. Much more my speed. 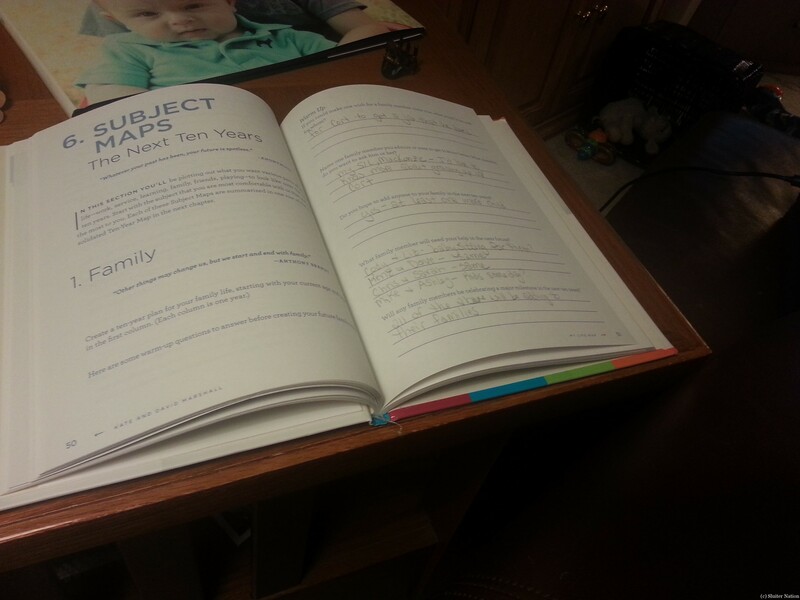 Cort and I have actually been slowly placing things in our 10-year plan…albeit in our minds and not on paper. This was a place to write it down. 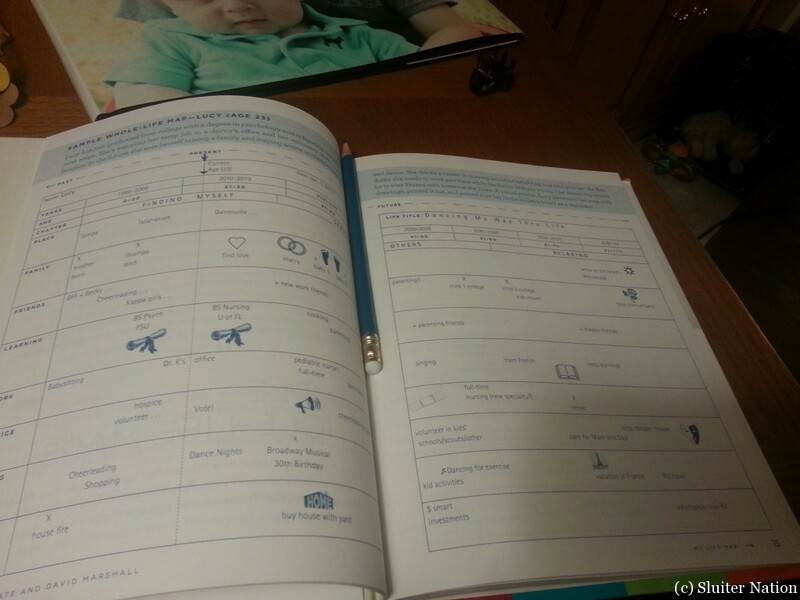 And just like the Whole Life Map, there was a section of questions to get you started. 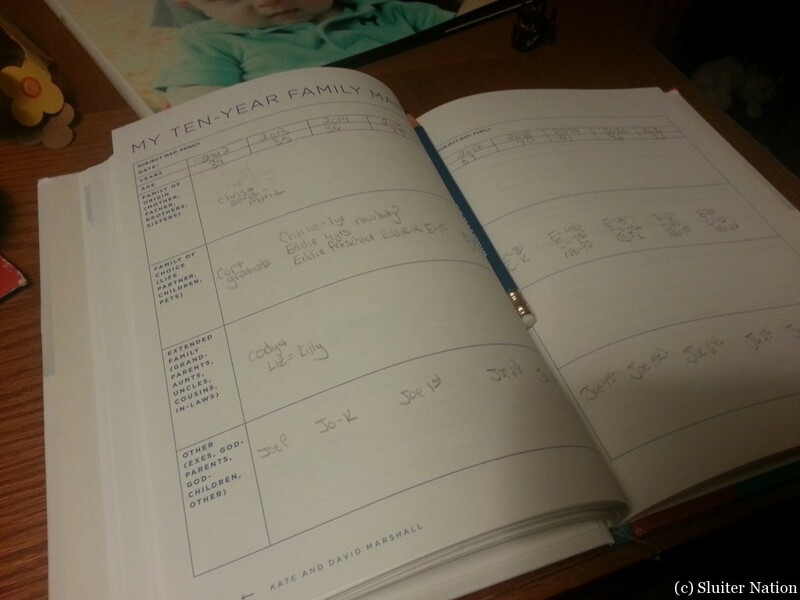 I filled in what I could of the Ten-Year Family Plan. And then I realized that when I turn 44, my oldest will be in the 7th grade. And I slammed the book shut. Other than give me anxiety, the book did help me realize that it would probably be better to do the book with Cort rather than on my own. And after I had started writing in the book, I noticed that it comes with directions on how to make the maps online…which would probably give me more room to be overly wordy. This book also made me realize that I am not ready to sit down and plan out each and every aspect of my life in detail. But it gave me something to talk with Cort about. What interested me most was the list in the back of the other books by these authors, particularly The Book of Myself: A Do-it-Yourself Autobiography in 201 Questions. You can imagine, that as a narcissistic blogger, my interest was piqued. Also on my list? The Book of Us: A Journal of your Love Story in 150 Questions. If you want to join our conversation about mapping our lives, come on over to Blogger’s Book Club where we are starting the convo with the question about service: Do you prefer to give your time or your money? But this is what I want to know right now…are you a planner? And if so, how do you plan your life? Or your day? Or even your hour? Disclosure: This is a paid review for BlogHer Book Club but the opinions expressed are my own. ha ha! I knew you would love that. I’ll have to show you tonight after conferences. I only peeked at it, but I am sure you could do it in excel if you wanted to. LOL! I needed that book 30 years ago. I think. I’m a notorious planner that the changes direction after the first couple of steps. But it would be fun to try. I am cracking up, because I wonder if the age of 44 was freakier or that Eddie would be in middle school!